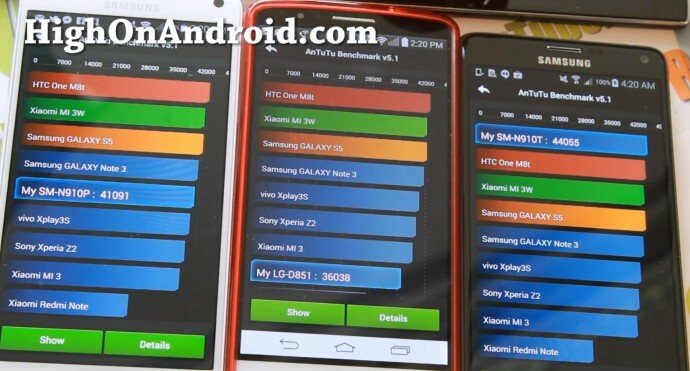 Note 4 vs LG G3 Benchmark Test with Antutu/Quadrant! Does quad-HD screen affect performance? The Samsung Galaxy Note 4 comes with quad-HD screen, which has 2560×1440 pixel resolution, that’s almost double the amount of pixels versus a 1080P screen. In my last benchmark test with the Note 4, S5, and the OnePlus One, we noticed that the Note 4 didn’t outperform the older Qualcomm 801-based phones (S5 and OnePlus One) by much. In fact, OnePlus One killed Note 4 in Antutu benchmarks. That got me thinking, and I decided to do a benchmark test against another quad-HD phone like the LG G3. The Note 4 clearly outperforms the LG G3 in every test, since both of these phones use quad-HD screen, this shows clearly that phones with quad-HD screens do need more CPU/GPU processing power, obviously due to the extra number of pixels. So, is it possible that a 1080P screen phone like the S5 or OnePlus One outperform Note 4 even with an older Qualcomm 801 processor? The answer is yes. Quad-HD screens may be brilliant and they do great for replaying any videos/photos higher than 1080P resolution but that comes clearly at the cost of performance. While I do highly enjoy great photos/videos on my LG G3 and Note 4, let’s not forget that you are sacrificing performance for it. Previous story Galaxy Note 4 vs. S5 vs. OnePlus One Benchmark Test!